"We shall be as a City upon a Hill." Governor Samuel Adams and Paul Revere set the keystone for the State House on July 4, 1795. The site was rural meadow on top of a steep hill, which until just recently had been John Hancock's meadow. 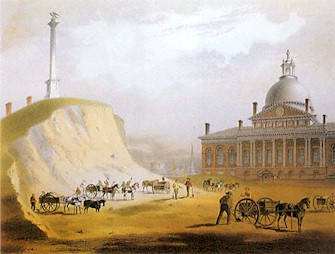 The ever industrious Revere would later be commissioned to top the wooden dome with rolled copper in 1802, which later was gilded in 1874. 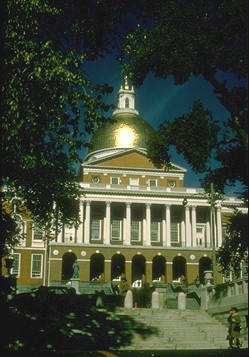 The Massachusetts State house was patterned after Somerset House (1776), considered to be England's leading 18th century civic building. The architect, Charles Bulfinch (1763-1844) had just completed the Connecticut State House which opened its doors in May of 1796, as the first state house in the union. The elevated portico, use of string courses, iron work, classical elements like Corinthian columns and brick construction are representative of federalist design. Even from this distance, the second floor's large square windows draw the eye upward to this piano nobile. Perhaps the greatest influence on Boston's development were the excavations on the three mountains (or trimont) in the center of Boston. Pemberton and Mt. Vernon were scrapped flat, and Beacon Hill was lowered by fifty feet to make room for the State House. The excavated dirt was carted down the hill by a gravity railroad, and dumped into the water at the foot of the hill, extended Boston's buildable land. In the coming decades entire new neighborhoods were added by similar means. The column shown here overlooking the State House is the Bulfinch column. In 1634 a sixty-five foot high mast had been erected on top of this hill, with a tar bucket which would be lit in the event of attack. (This is the beacon which for which Beacon Hill was named.) Fifty six years later, still unused, the beacon blew over, and remained laying on the ground. The community spirited Bulfinch raised funds to build comparable sized Doric column from bricks which was reminiscent of column overlooking cities he had seen in Europe. During this time Charles Bulfinch functioned as the person in city and state government who controlled development, and the workings of private developers, such as Harrison Gray Otis, who participated in the development of Beacon Hill. To see a panorama, click the buttons below, and in the popup window, hold down mouse button and move mouse to move through virtual environment.